Makerspaces are popping up in schools and libraries across the country. 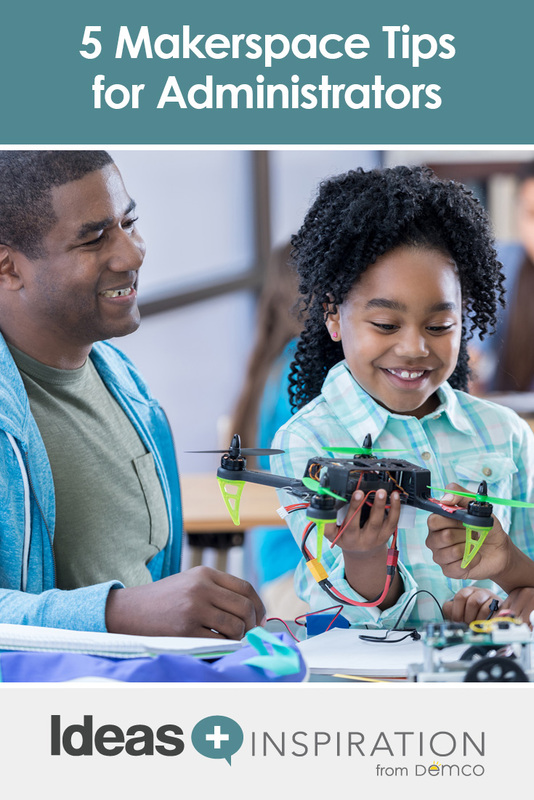 This exciting trend presents opportunities for hands-on learning and active student engagement through design, engineering, tinkering and repurposing. As these new learning spaces are being designed and implemented, many school administrators are leading the charge for creativity and innovation. For others, the thought of starting a makerspace can be challenging. The design, training and management of effective makerspace learning requires time and energy, adding more onto the plates of busy school leaders and staff. As an administrator who has spearheaded new makerspaces in two different school districts, I’ve come to realize five important lessons that every school leader and district administrator needs to know about starting a makerspace. 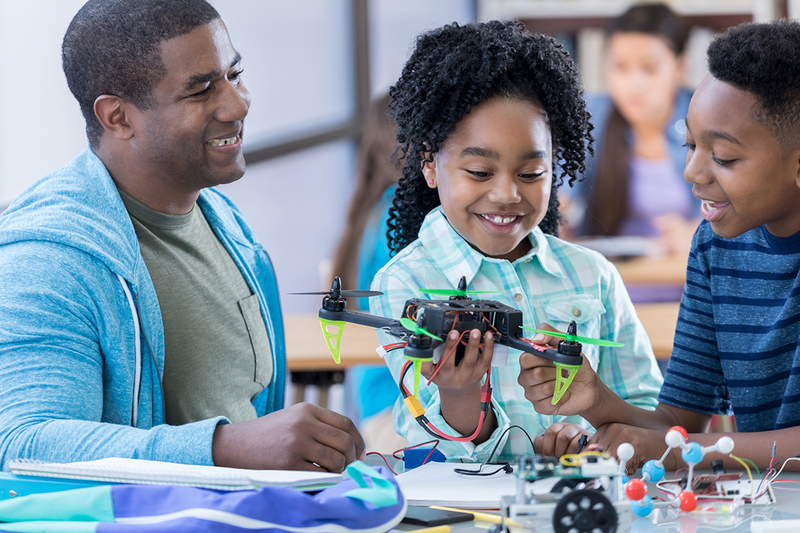 If you’re an administrator, you can use these lessons when starting a makerspace or to support the learning happening in your current makerspace. If you’re a teacher or librarian, you can share them with your own administrators to help garner their support for starting a makerspace. 1. Messy Learning Is Good Learning! The idea of the orderly classroom being the most effective classroom is no longer applicable. Makerspaces are active learning spaces where students have the freedom to create new things, using tools such as hot glue guns, paint, cardboard, LEGO® pieces, robotics and hundreds of other materials. This may trigger an image of a busy workshop or a messy art studio; however, even though these innovative learning spaces are often unconventional, they include the excited voices of makers and the valuable conversations that happen when creativity is ignited. School leaders have to remember that messy learning is good learning. When students deconstruct, build and create, their imaginations are activated. This type of learning and this type of environment are not neat and organized — there will be spills and disarray. If you are a neat freak, take a deep breath and accept that the learning in your makerspace will be enriching and meaningful for students (and teachers). In my book, STEAM Makers: Fostering Creativity and Innovation in the Elementary Classroom, I share a story about a teacher who expressed the importance of feeling like she had permission to try new things. Uncertainty and failure are huge risks for teachers to take in the makerspace, and as administrators, we need to support their freedom to take these risks. Somehow, we have lost that component of learning: the productive struggle and persistence that comes when you attempt something challenging. Teachers need to hear that it’s okay to try something new — even if it fails. Leaders, encourage your teachers to take the leap. Let them know that your school culture values risk-taking in the makerspace and in the classroom. Support your teachers’ steps towards innovation and provide them with the tools they need to be successful. As leaders, we need to model what it means to be an active and engaged learner. I know that “lifelong learner” is a bit of a buzzword, but it’s an accurate description of a quality we want to instill and nurture in our students. In a makerspace, the learning is never-ending. There is always a new skill to learn, a new person to connect with or a new challenge to tackle. If we want the students and teachers in our schools to fuel their curiosity, then we need to jump right in and get involved. Don’t know how to code? Visit the library makerspace and learn alongside the students. Interested in LED wearables but aren’t sure where to get started? Pull up a chair and learn with your students. Principals, curriculum directors, superintendents — I mean you! Learn with your students and teachers. Leaders — let your guard down. Be vulnerable and show those in your school community that being a leader doesn’t mean knowing how to do everything. It means accepting that learning new skills is a part of the job and that it’s important to share with others. Are there community members who will donate tools and materials? What skills and expertise can parents share in the makerspace? Who might you partner with to support the growth of your maker learning? Are there organizations or companies that would be willing to partner with you or donate to maximize learning? Learning Facilitator: Some schools have a facilitator or librarian who has the expertise to support making. Other schools encourage classroom teachers to take ownership of the space. 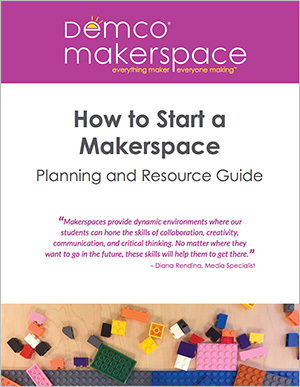 Maker Manager: Who will manage the materials in your makerspace? Is this a group effort? Do students have a role? Who ensures that things are restocked and cleaned up for other makers? Where are materials stored and organized? School leaders need to determine what this will look like in their space. Imagination Engineer: Creative learning happens in the makerspace. Sometimes this is student-generated with projects and ideas coming from student interests and passions. Teachers may also generate ideas that are connected to curriculum. School leaders may want to have someone to organize lessons or project ideas to be shared district-wide. This may be in the form of a shared Google Doc or a website to share maker learning with others. As a school leader, consider ways you can leverage learning in your school community by using local resources. You can also use social media to tap into global resources and connections from your learning networks. 5. Take Time to Celebrate! Display makerspace projects throughout the school. Plan an event that engages parents and community in the joy of making, such as a Maker Fest. Promote the making that happens in your space through Twitter, Facebook and Instagram, as well as in your newsletters and on your website. The maker movement is continuing to grow in schools. School leaders and district administrators can do a lot to support this learning for teachers and students. If you are just starting a makerspace or if your makerspace is already in full swing, consider the ways that you will foster the innovation and creativity happening in your space.